Michigan had two turnovers in the endzone which cost them points, but they don't address the fact that Michigan was outgained 536 yards to 377 yards, allowed 5.9 YPC on 42 carries (! ), and forced all of seven incompletions, allowing Cousins to throw for 11.4 YPA. Michigan was crushed in this game in almost every aspect. They hardly belonged on the field with Michigan State. Given what we know about this team--that Denard is young and inexperienced, the secondary is young and starts walk ons, and the team can't tackle--there's very little to say that this was an aberration or that this isn't indicative of how the team will perform going forward, unsettling as that may be. The future of the program looks bright. it's riddled with young talent and should-be stars/contributors. But that's only if Rodriguez can hang on long enough to see the team to the promised land. And unfortunately, the future of this team isn't all that promising. You know what followed: Michigan finished 2-5, including an ugly beating in a bowl game, as well as lopsided losses to Ohio State and Wisconsin. Their only two wins were the triple overtime defensive crapshow against Illinois and the snowbowl against Purude. The good news is that 2011 doesn't look quite as harrowing as 2010 did--partially because of Michigan's remaining schedule--but that's not to say Michigan will finish out the season with much more success than they saw last year. The most positive aspect of this season has been the revelation that Michigan's coaching staff is a significant upgrade over last year's. It has been so good, in fact, that I've had to create tags like "Al Borges' diabolical machinations" and "reasons to love Greg Mattison." Blitzes, overall defensive improvement, and an increasingly expansive offensive playbook all contribute to a coaching staff that is keeping opponents on their toes and providing tangible improvement from the personnel they've inherited. One of those inherited player groups is the surprisingly competent secondary. The return of Troy Woolfolk was supposed to improve a still young and inexperienced secondary. In reality, Woolfolk looks far from 100% and has been pulled in favor of true freshman Blake Countess in each of the last few games. Though Countess has been the unsurpassed bright spot from the secondary, mainstay Jordan Kovacs has continued to his streak of competent-to-good play while second corner JT Floyd and free safety Thomas Gordon have all contributed to a unit that hasn't allowed any long touchdowns or massive breakdowns through the first seven games of the season. This constitutes unbridled success. In spite of a 6-1 start and the coaching and secondary improvement, the rest of the season has been either disappointing or flat out bad. First, the obvious: Denard Robinson's clear regression in the passing game. I was more skeptical of Denard entering this season than most. His struggles on obvious passing downs, high INT rate, poor spring game performance, and a changing offensive system that emphasized his arm rather than his legs painted the picture of a quarterback who would experience massive regression. What we've seen is exactly that: Denard is completing only 52% of his attempts and has thrown only 11 TDs to 10 INTs. More importantly, his arm was the primary reason behind Michigan's loss to MSU (caveats about the weather apply). The second most disappointing aspect of the season has been Michigan's defensive front seven and run defense. Despite a mostly experienced group, the likes of Mike Martin, Kenny Demens, and Craig Roh have been largely ineffectual this season. Demens has frequently struggled with diagnosing plays, something that was an issue last year as well. Meanwhile, Michigan has gotten the bare minimum production out of the defensive line, a unit that was projected to really excel with the likes of returning starters Martin, Roh, and Ryan Van Bergen leading the charge. The team's less experienced defensive ends and linebackers (Jake Ryan and Brennen Beyer, specifically) have accounted for a lot of Michigan's trouble defending the run. The team has shown discipline problems defending the run by allowing offenses to easily gain the edge and get to the second level. Fortunately, this is something that should improve throughout the season, one of the few negative trends this season that could be easily correctable. The reason this season has the potential to end better than last year is because of the state of the Big Ten. Michigan's final five opponents (Purdue, Iowa, Illinois, Nebraska, Ohio State) are all seriously flawed. Where once Illinois and Nebraska looked like intimidating forces, their recent collapses make them far less terrifying. Unfortunately, beating anyone else on the schedule largely hinges on Denard's improvement in the passing game. If he continues to struggle, it's possible that Devin Gardner, who has seen more and more snaps as the season has progressed, will take over the starting role. Beyond this season, the future looks bright. Michigan has amassed one of the best recruiting classes in the country and with open season on high-profile recruits like Bri'onte Dunn and the recently flirtatious Gunner Kiel, the staff could bolster an already impressive recruiting haul. Combine that with the coaching staff's impressive start and the Hoke administration is aligned to be more successful sooner than most people thought they would be. You know the future is bright. 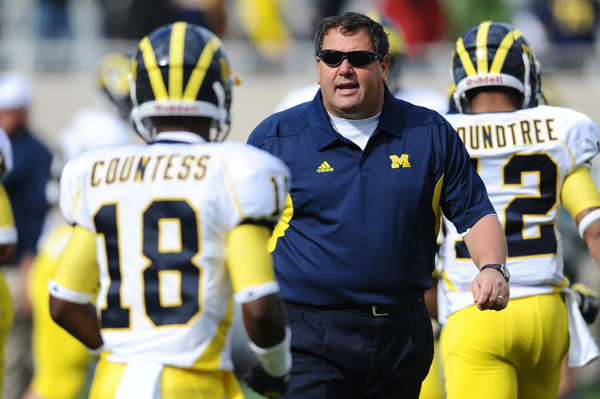 Why else would Hoke wear those shades?